Download the Envato Market plugin from here. The plugin is available via Github and is completely free. All you need to do is to go to the Envato Market Github page and click on the Download .zip button. To install the plugin navigate to Plugins > Add New and click on the Upload Plugin button at the top of the page. Now that the plugin is installed and active you should see a new Envato Market menu item in your WordPress dashboard. You will need to sync the Envato Market plugin with your Envato account to have access to all of your marketplace purchases as well as item updates. IMPORTANT: You must be logged into the ThemeForest account that was used to purchase the LeadEngine theme. Navigate to Envato Market menu item seen in your WordPress dashboard menu list. Click on the Generate A Personal Token link provided to be directed to the Token Creation page. Enter a name in the “Token Name” field. For example: LeadEngine. 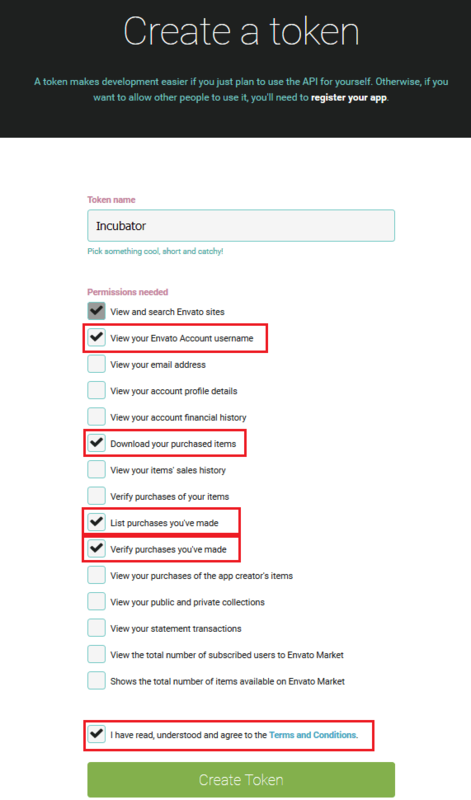 Check the “Terms and Conditions” checkbox, then click “Create Token”. You’ll now see the “Success!” page with your Personal Token displayed. Copy your token code (this is very important since Envato doesn’t store a copy of the token for you), check to confirm that you’ve copied it and click the white button that you got it. Go back to your WordPress installation and paste in your Envato API token then click save. Once your token is saved and validated your page will refresh to show your Envato Market landing page with added tabs for your items. Remove the wp-content/themes/leadengine folder via FTP and re-upload it as shown here. When the theme is updated, update the required plugins if you see the Require Update notice next some plugins name.